This page provides troubleshooting tips and debugging strategies that you might find helpful if you're having trouble building or running your Cloud Dataflow pipeline. This information can help you detect a pipeline failure, determine the reason behind a failed pipeline run, and suggest some courses of action to correct the problem. 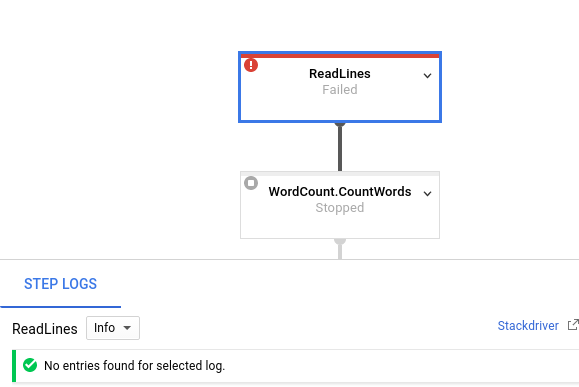 Cloud Dataflow provides real-time feedback on your job, and there is a basic set of steps you can use to check the error messages, logs, and for conditions such as your job's progress having stalled. For guidance on common errors you might encounter when running your Cloud Dataflow job, see the Common error guidance page. Note: If a job fails, Cloud Dataflow might not automatically clean up your temporary and staged files. In this case, manually remove these files from any Cloud Storage buckets that are used as temporary buckets. You can detect any errors in your pipeline runs by using the Cloud Dataflow monitoring interface. Go to the Google Cloud Platform Console. Select your Google Cloud Platform (GCP) project from the project list. Click the menu in the upper left corner. Navigate to the Big Data section and click Dataflow. A list of running jobs appears in the right-hand pane. Select the pipeline job you want to view. You can see the jobs' status at a glance in the Status field: "Running," "Succeeded," or "Failed." Figure 1: A list of Cloud Dataflow jobs in the Developers Console with jobs in the running, succeeded, and failed states. If one of your pipeline jobs has failed, you can select the job to view more detailed information on errors and run results. When you select a job, you can view the execution graph as well as some information about the job on the Summary page to the right of the graph. During execution, the top of the page contains a button to view logs, as well as indicators if the job generated errors or warnings. Figure 2: A Cloud Dataflow Job Summary with errors indicated. You can click the Logs button to view log messages generated by your pipeline code and the Cloud Dataflow service. Filter the messages that appear in the logs panel by using the Minimum Severity drop-down menu. Select the Error filter to displays error messages only. Click the triangle icon next to each error message to expand it. Figure 3: A list of Cloud Dataflow Job Error messages, with one message expanded. When you select a step in your pipeline graph, the logs panel toggles from displaying Job Logs generated by the Cloud Dataflow service, to showing logs from the Compute Engine instances running your pipeline step. Figure 4: The Cloud Logging button in the Cloud Dataflow Job Summary. Stackdriver Logging combines all of the collected logs from your project's Compute Engine instances in one location. See Logging pipeline messages for more information on using Cloud Dataflow's various logging capabilities. this workflow with the following override flag: [OVERRIDE FLAG]. Contact Google Cloud Support for further help. Please use this identifier in your communication: [BUG ID]. After reading the caveats in the linked bug details, if you want to try to run your pipeline anyway, you can override the automated rejection. Add the flag --experiments=<override-flag> and resubmit your pipeline. Graph or pipeline construction errors. These errors occur when Cloud Dataflow runs into a problem building the graph of steps that compose your pipeline, as described by your Apache Beam pipeline. Errors in job validation. The Cloud Dataflow service validates any pipeline job you launch. Errors in the validation process can prevent your job from being successfully created or executed. Validation errors can include problems with your GCP project's Cloud Storage bucket, or with your project's permissions. Exceptions in worker code. These errors occur when there are errors or bugs in the user-provided code that Cloud Dataflow distributes to parallel workers, such as the DoFn instances of a ParDo transform. Slow-running pipelines or lack of output. If your pipeline runs slowly or runs for a long period of time without reporting results, you might check your quotas for streaming data sources and sinks such as Cloud Pub/Sub. There are also certain transforms that are better-suited to high-volume streaming pipelines than others. Errors caused by transient failures in other GCP services. Your pipeline may fail because of a temporary outage or other problem in the GCP services upon which Cloud Dataflow depends, such as Compute Engine or Cloud Storage. A graph construction error can occur when Cloud Dataflow is building the execution graph for your pipeline from the code in your Cloud Dataflow program. During graph construction time, Cloud Dataflow checks for illegal operations. ... GroupByKey cannot be applied to non-bounded PCollection in the GlobalWindow without a trigger. Should you encounter such an error, check your pipeline code to ensure that your pipeline's operations are legal. Making sure the service can access your job's associated Cloud Storage buckets for file staging and temporary output. Checking for the required permissions in your GCP project. Making sure the service can access input and output sources, such as files. ... Executing BigQuery import job "dataflow_job_16868399470801619475". ... Workflow failed. Causes: ...BigQuery-Read+AnonymousParDo+BigQuery-Write failed. Causes: ... BigQuery getting table "non_existent_table" from dataset "cws_demo" in project "my_project" failed. ... Checking required Cloud APIs are enabled. ... Job 2016-03-08_14_12_01-2117248033993412477 is in state JOB_STATE_RUNNING. ... Combiner lifting skipped for step group: GroupByKey not followed by a combiner. ... Expanding GroupByKey operations into optimizable parts. ... Annotating graph with Autotuner information. Causes: ... Unable to view metadata for files: gs://dataflow-samples/shakespeare/missing.txt. INFO:root:Job 2016-03-08_14_12_01-2117248033993412477 is in state JOB_STATE_FAILED. Causes: ... BigQuery getting table "non_existent_table" from dataset "cws_demo" in project "x" failed. While your job is running, you may encounter errors or exceptions in your worker code. These errors generally mean that the DoFns in your pipeline code have generated unhandled exceptions, which result in failed tasks in your Cloud Dataflow job. ... Autoscaling is enabled for job 2017-05-23_14_02_46-1117850763061203461. ... The number of workers will be between 1 and 15. ... Autoscaling was automatically enabled for job 2017-05-23_14_02_46-1117850763061203461. ... Workers have started successfully. Note: The Cloud Dataflow service retries failed tasks up to 4 times in batch mode, and an unlimited number of times in streaming mode. In batch mode, your job will fail; in streaming, it may stall indefinitely. INFO:root:Job 2016-03-08_14_21_32-8974754969325215880 is in state JOB_STATE_RUNNING. INFO:root:... Expanding GroupByKey operations into optimizable parts. INFO:root:... Annotating graph with Autotuner information. INFO:root:...: ...: Workers have started successfully. You can log the failing elements and check the output using Cloud Logging. You can have your ParDo write the failing elements to an additional output for later inspection. """A DoFn that filters for a specific key based on a regex.""" # word lengths in the input PCollection. You can have your ParDo write the failing elements to a side output for later inspection. In the left-hand navigation pane, click APIs & services. In the Search Box, search for Cloud Pub/Sub. Check Response Codes and look for (4xx) client error codes. Use Combine.Globally.withFanout instead of Combine.Globally. Use Combine.PerKey.withHotKeyFanout instead of Count.PerKey. This is a beta release of Python streaming pipeline support. This feature might be changed in backward-incompatible ways and is not subject to any SLA or deprecation policy.